Six Qatargas technical engineers recently completed an engineering training program at Chiyoda Company offices in Doha and Yokohama, Japan. The 6 week program was carried out in two phases with the first phase being held in Chiyoda Almana Engineering LLC offices for a one week introduction to engineering disciplines involved in Liquefied Natural Gas (LNG) brownfield projects and a pre-travel induction. The second phase of the program was conducted in Chiyoda Global Headquarters in Yokohama, Japan for a further five weeks where the program consisted of lectures and exercises relating to theoretical and practical understanding of many key engineering fields related to effective design and operation of LNG facilities. Chiyoda, the leading Japanese engineering company operating in Qatar since 1970’s and Chiyoda Almana, its local subsidiary in Qatar established in 2008, have a long-term business relationship with Qatargas, which was further extended to include human resources development. 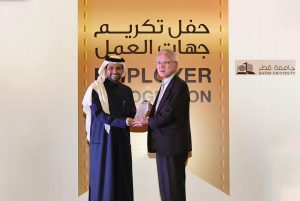 The training program which has been prepared and developed based on Chiyoda’s global leadership in LNG engineering, design and construction, aims to enhance Qatargas engineers’ technical understanding and expertise, and also includes cultural exchange and introduction of Japanese business environment to promote better understanding of various business models.